Ravalika Gopireddy is currently pursuing her International Master in Business (IMB) degree at SDA Bocconi Asia Center (Mumbai, India) for the academic year 2018-2020. 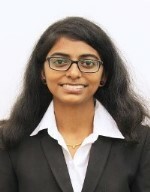 She holds an Engineering degree in Electrical and Electronics Engineering from Sri Venkateswara University (Tirupati, Andhra Pradesh, India), where she studied from 2012-2016. Ravalika worked as a software developer for 2 years (2016-2018) in Infosys Ltd., Hyderabad, India. She was responsible for developing programs using .Net technologies and also keeping track of the performance and progress of her team. Her main part of work includes Database management and migration of databases to one platform. She also handled support activities for solving the issues with deliverables. To see Ms. Ravalika’s more detailed CV, click here. Share the post "Ravalika Gopireddy"